Wednesday 21st of April was the day that a group of service-design-minded people came together -attracted by a greatly inviting sign- at the recently opened 31Volts HQ! It has been a while since the last drinks but a lot of things are going to happen in the coming months. 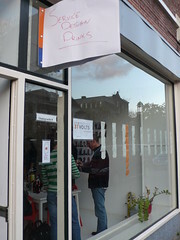 The drinks proof to be the ideal ground for interessesing discussions, which are usually not so much about service design. Somehow I feel the vibe changing in community. We’re moving past the point where we have to discuss / defend the need of service design. People are now exploring the field and looking how their expertise fits in. This is a huge step forward. The nature of service design has always been inclusive instead of exclusive. So now that people are making connections the field is getting more exciting! 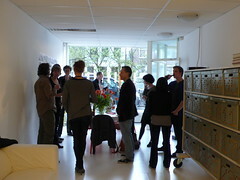 Keep a close eye on servicedesignnetwerk.nl because we’ll be hosting more Thinks, Talks & Drinks then ever before! We’re always open for people who’d like to contribute. So if you have any ideas get in touch!